Across the towns, villages and cities of Ontario, there are many stories of women and men who played a vital role to ensure that their descendants would have access to education, health and judicial services in French anywhere in Ontario. For the purpose of this article, I have chosen to summarize three events where Franco-Ontarian women were on the front line of French language rights: in Ottawa, Sudbury, and Sault Ste. Marie. The infamous Règlement 17 was a regulation of the Ontario Ministry of Education, issued in July 1912 by the Conservative government of premier Sir James P. Whitney. It prohibited the use of French as a language of instruction in all Ontario schools. In 1916, representatives from the provincial government marched onto the grounds of l’école Guigues in Ottawa with the intent to close down the school, which was apparently not abiding by Regulation 17. Yes, teachers were still teaching en français to the children! Brandishing their hatpins, a group of mothers blocked the entry to the school and prevented the inspectors and police officers from entering “their” school. This event is often remembered as la Bataille des épingles à chapeaux. Supported by a crowd of 1,000 people cheering them on, two local sisters, teachers Diane and Béatrice Desloges (who risked losing their teaching license), accompanied by 19 mothers, truly took matters “into their own hands.” Enough was enough. It was time to stand up to the authorities and put an end to an unjust and anti-francophone rule aimed at what was perceived to be a plan to eradicate the French minority in Ontario. From a sociocultural and historical perspective, the Règlement 17 situation was occurring at a time when all of Canada was still defining its identity. “The slow evolution of a Canadian identity rubbed up against Canada’s passionate attachment to “the Old Country”, and in 1915 no province was more profoundly British in its sentiment than Ontario”. (Charlotte Gray, 2013). Emotions were running high. In this climate of uncertainty and ‘political bullying’, these 21 brave women came to be known not only as heroines but also as symbols of les forces de la résistance franco-ontarienne. The regulation was finally repealed in 1927 but was not officially abolished from the laws and statutes of Ontario until 1944. Furthermore, French language schools in Ontario were not officially recognized under the provincial Education Act until 1968. That infamous event at l’école Guigues took place on January 4th, 1916, ninety-eight years ago. The heroines of the day will always be affectionately remembered as les gardiennes de l’école Guigues. Les gardiennes de l’école Guigues d’Ottawa en 1916. Troisième rangée : Albertine Sarault, Euphrasie Dubé, Annette Trépanier, Marie- Antoinette Bérubé, Donalda Blais et Adèle Défayette. 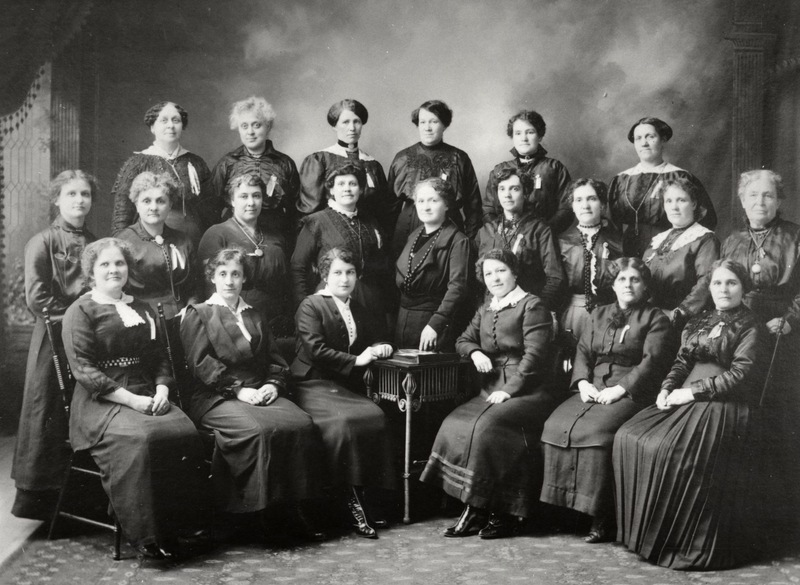 Deuxième rangée : Alice Lafrenière, Honorine Brazeau, Valentine Bédard, Yvonne Grenon, Marie-Blanche Desloges, Adelia Richard, Georgianna Lapierre, Adèle Baizana et Agnès Blanchette. Première rangée : Ernestine De La Salle, Alexina Fink, Diane Desloges, Béatrice Desloges, Delisca Dionne et une personne non-identifiée. Université d’Ottawa, CRCCF, Fonds Association canadienne-française de l’Ontario (C2). Reproduit des Archives municipales de la Ville d’Ottawa. It was the 1970s. Women were celebrating their first International Women’s Year/Day (1975), the Quebec Sovereignty Movement was gaining momentum and Margaret Thatcher was elected leader of the British Conservative Party (1979). Change was taking place all over the world! In Ontario, the francophone population had been officially promised language rights in the provincial judicial system since 1970. Yet, promises had not been kept and Franco-Ontarians were becoming restless. On February 26, 1975, Jacqueline Pelletier, a community leader and well-known activist for francophone rights in Ontario, was arrested for speeding in Ottawa. As her speeding ticket was in English only, she refused to pay unless the ticket was bilingual. The alternative? Jail. Other Franco-Ontarians soon took similar actions, refusing to renew their driver’s license or pay for parking tickets unless the documents were translated into French — soon, a ‘citizen’s movement’ was born with the aim to apply pressure on the government through civil disobedience. Between July 1975 and February 1976, many Franco-Ontarians went to prison because they refused to pay their fines or renew their driving license. Most of them were women. Although some were jailed for one day, others were jailed for two nights — Michelle Deshaies, Lise Denault, Jacqueline Pelletier and Huguette Boisvert. But one brave woman was imprisoned for 5 nights! Indeed, Lise Pellerin, a 22-year old nurse’s aid from Sudbury courageously refused to pay a $5 fine and $4 court costs because the summons was in English only, and off to prison she went. She was quoted in a local English paper covering her arrest as saying: “What I would like very much is to find other people who are willing to go to jail, but most people are afraid”. 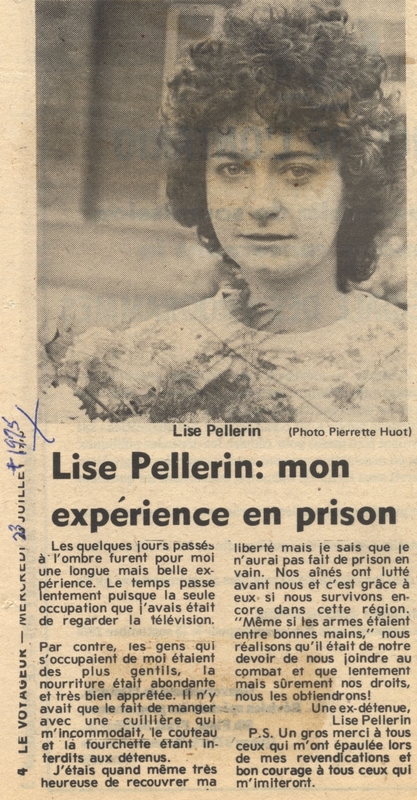 « Lise Pellerin : mon expérience en prison ». Photo : Pierrette Huot, article paru dans Le Voyageur, 23 juillet 1975. Université d’Ottawa, CRCCF, Fonds Association canadienne-française de l’Ontario (C2). Finally, in 1984, the Courts of Justice Act was passed in Ontario guaranteeing linguistic rights to Francophones in the courts. The unflinching determination of a small but determined group of individuals had prevailed. Solange Fortin was raised in Sault. Ste.Marie where she attended l’école primaire Saint-Ignace. Although Solange left her hometown for a short while to pursue her studies in Sturgeon Falls, Ottawa, Sudbury and then to teach in Cochrane, she moved back to settle with her family in the Soo in 1972. As a teacher and a mother, Solange cared deeply about her children’s education and the life opportunities that lay ahead for them. And she also cared about the future of the French-speaking population of Sault Ste. Marie. For 15 years, she worked tirelessly on behalf of the city’s 3,000 Francophones. In 1979, she established and eventually coordinated Le Centre francophone, the first of its kind in Sault Ste. Marie. This cultural centre served as a welcome hub for the local Franco-Ontarian population within which Solange also founded the first social club for the francophone elders of her community, the Club de l’âge d’or. One of Solange’s goals in the late 1980s, along with other French parents in the Soo community, was to secure funding that would allow the francophone community to create a ‘French only’ learning environment. Indeed, as a result of French immersion programs, the French-language schools in Sault Ste. Marie were filled up with mostly English speaking children. The quality of the education was failing local francophone children who, as a minority in the classroom, spent much of their time helping their fellow students understand the French language and catch up to the lessons of the day. The group, led by Solange, took their battle to the public board of education in 1988, asking them to provide French-language education for their 53 kids. Their long-term plan was to create an enriched school/community centre for francophone children. It was an ambitious and innovative approach to education — the first of its kind in the province. Not only did city council accept the petition, 11 councillors out of 13 voted to immediately adopt the resolution! On that cold January day, Sault Ste. Marie’s francophone minority felt the brutal and blunt message delivered by their city council. Solange Fortin was chair of the board at Le Centre francophone. Within her role as board director and well-known activist for francophone rights in Sault Ste. Marie for 15 years, she found herself in the middle of an explosive language debate. As all of this was taking place, the Ontario government had recently introduced a law, La loi 8 sur les services en français (French Language Services Act) in 1986, officially adopted in 1989. To say that there were linguistic tensions in Ontario at the time is a significant understatement! And Sault Ste. Marie unwillingly became the main focus of the provincial linguistic tensions. I would like to thank Nicole Bonsaint, archivist at the Centre for Research on French Canadian Culture at the University of Ottawa for her incredible support and her permission to use the photos published in this article. I would also like to thank James LaForest of Voyageur Heritage and the French Canadian Cultural Alliance of the Great Lakes for publishing this historical account. References: femmesdelaroute11.wordpress.com; Charlotte Gray, The Massey Murder, 2013; crccf.uottawa.ca; thecanadianencyclopedia.com; “Soo Language Wars”, Chatelaine/July 1990; “L’avenir n’est pas rose à Sault Ste-Marie”, Femmes d’action, Vol. 19, No 4/1990; hopitalmontfort.com; radiocanada.ca. Jeannine Ouellette, M.A.Ed., is the author of the blog Les Elles du Nord. She previously contributed “A Bend in the River” to The Storykeepers Project. This article is also available in French translation in the journal Le Houallet. Copyright © 2014 Jeannine Ouellette. No duplication without permission. Merci Jeannine! Ces femmes étaient tellement courageuses! C’était très intéressant à lire. Merci pour votre commentaire Stephanie. En effet, ce sont des femmes fort inspirantes par leur dévouement et leurs actions !